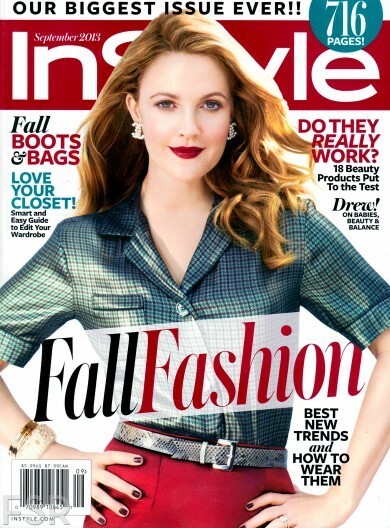 –Drew Barrymore looks gorg on the cover of InStyle UK. -Well, this might just be the creepiest thing ever: Jennifer Lopez‘s stalker has secretly been living in her pool house. -Speaking of JLo, Diddy reportedly passed on Idol because of her. –Video of Peter Dinklage hula-hooping on the dance floor of a gay bar in Calgary has gone viral, proving that the internet works just as it should. –Madonna is still trying to make her grill happen. -The girl who inspired Hazel in John Green‘s The Fault In Our Stars by has become an author — posthumously. –Drake just revealed the album art for Nothing Was the Same, while announcing that he’s pushing back its release date. -Everyone seems to think yesterday’s awesome blind item in The Wrap is about Mariah Carey, which makes it even more awesome. -Are Cameron Diaz and Jason Segel a thing? The Bad Teacher costars were reportedly spotted on a dinner date in the Hamptons, and then grocery shopping at Citarella. –Robert Pattinson‘s new Dior commercial is basically just him watching models strip around him. -Meanwhile, Louis CK told Letterman that he once found a dead guy floating in East River. -A new Catching Fire photo has arrived. -The first trailer for The Book Thief as arrived. That novel stayed with me for a long time. -Does Lindsay Lohan have a sugar daddy? –Julianna Margulies is potentially facing a messy trial now that she’s being sued by her former manager. She should hire Elsbeth! –Julianne Hough has a boyfriend who isn’t Ryan Seacreast. -Noted food lover Gwyneth Paltrow somehow managed to only eat steamed veggies while everyone around her ate pizza and pasta. –Aziz Ansari just got paid a ton of money to write a book about modern romance. -Funny or Die pitted Steve Martin against Kermit the Frog for duelling banjos. –This might be the best thing I’ve read today. –This confirms all of my assumptions about what dinner conversation with the Kardashians would be like. -Meanwhile, a new clip from Kanye West‘s appearance on Kris Jenner‘s show has arrived. Why does it look like they can barely stand to be in the same room? -Here’s the first trailer for Pompei, starring lickable Game of Thrones star Kit Harrington.